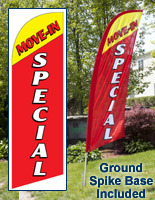 Attention Flags with a "MOVE-IN SPECIAL" Message Sell at Low Price Points! 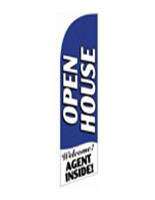 Portable Blade Banners Are Stocked with Many Realtor-Oriented Messages! 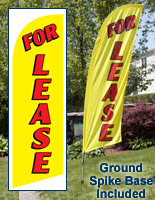 Buy Attention Flags to Sell or Rent a Property Faster! 8' Height and high-contrast color scheme for visibility. 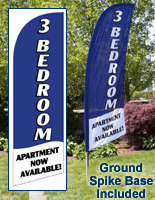 Attention flags are a powerful tool for filling vacant apartments, flats and homes. This particular display belongs to a series of realtor banners specifically designed to reduce the time it takes to fill vacancies or sell property. These attention flags have a pre-printed message, which reads "MOVE-IN SPECIAL". 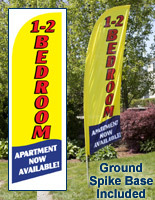 Real estate agents and property managers can place these banners in front of their property to promote special deals for renting or buying a unit. These attention flags that flutter have bold white text printed on a blue background. This color scheme has a high contrast so potential renters and buyers can read the message from afar. 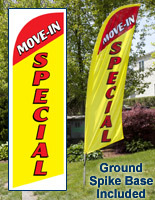 Above the "SPECIAL" text, "MOVE-IN" is printed on the attention flags in red lettering on a yellow background. The four-color design makes these vibrant, welcoming and enticing. These feather banners, attention flags that fly, are made from a knitted polyester fabric, which is ultra-light weight to flutter in the wind. A cord connects the banner to the pole so the pennant is held taut, and easy to read even when there is minimal wind. 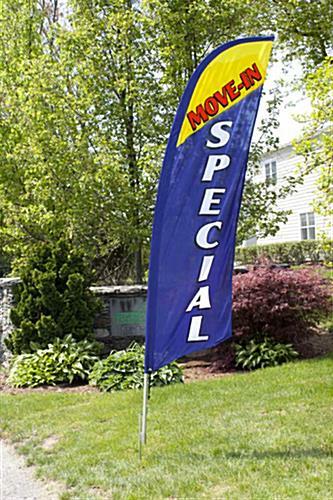 Attention flags that promote move-in specials are not only effective at filling rental properties and selling properties faster, but these particular swooper banners also have a list of user-friendly features property managers and real estate agents will find very convenient! What are these user-friendly product attributes? 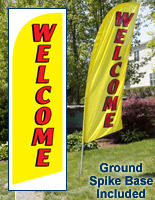 The move-in attention flags are portable, easy-to-assemble and durable. Each flagpole is constructed from (2) aluminum and (2) fiberglass lengths of material. Since the top two seconds of the flagpoles are fiberglass, they bow to create a classic feather shape usually seen in outdoor pennants. However, the fact that the bottom sections are aluminum keeps the overall cost of this unit low. The 8' attention flags slide onto the included ground spike with minimal effort once inserted on the pole. 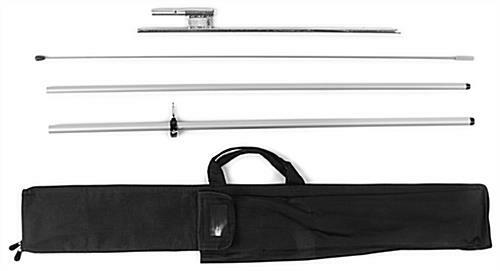 A ground spike base comes with the unit to provide the most flexibly in where the blade banners are placed. 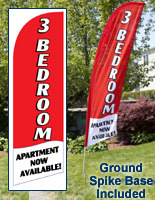 Commonly, one might see these promo banners flying on the front yard of a home, in front of a rental office, or lining the entrance of an apartment complex. As a final bonus, the purchase of this real estate flag includes a black nylon carrying bag for organized transport and storage.